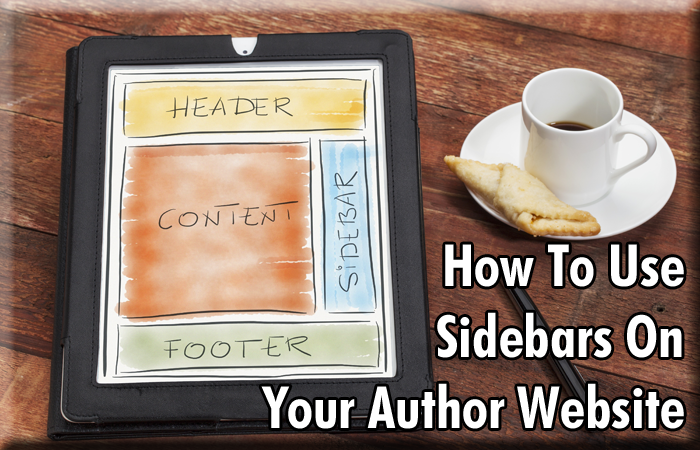 As you’re setting up the layout of your author website—or working with a Web developer who’s doing it for you—you will have to decide if you want to include a sidebar. A sidebar is a secondary source of information and navigation to the left or right of a site’s main content. When used wisely, a sidebar can add valuable functionality and visual interest to your website. Many websites have at least one sidebar. Sidebars are a great way to supplement site content by drawing attention to important links, calls to action, and other helpful information for your visitors. But what exactly goes into a sidebar? And does your site even need one? A well-stocked sidebar, when design- and content-appropriate, can do wonders in terms of aesthetic and site functionality. So what should go into it? As with page content, the most important information or call to action should go on top, preferably above the fold. Do you want people to subscribe to your newsletter? Buy a copy of your book? Read through the archives of your blog? Put that nudge at the top of your sidebar, then work your way down by listing any additional information from most important to least. Your first instinct may be to fill the sidebar of your website with everything you think visitors need to see. EVERYTHING. Before you know it, there are so many widgets and buttons and links cluttering the sidebar that it’s running longer than the length of the actual page! People are going to do just so much scrolling before they start to feel overwhelmed by the sheer number of things you’re asking them to click on. Bombard visitors with too many options and they may react by not clicking on any. To make matters worse, you’re distracting them from the main content of the page itself. With each potential sidebar item, ask yourself: “Is this information absolutely vital? Does not having this item negatively affect the efficiency of the website?” If the answer is no, consider removing it. Sometimes writers want a sidebar because it “looks cool,” but they don’t know what to put in it. The result is a sidebar full of random, unnecessary stuff. There is no rule that says a website must have a sidebar, and many sites don’t. Either the content is organized in a way that it doesn’t need to be supplemented, or the information that would normally go into the sidebar is displayed in other creative ways. You can use simple alternatives, like creating a separate links page for your list of favorite websites or putting your social media widgets into the footer of the site. Of course, what does or doesn’t work varies from writer to writer, website to website. As long as you have a clear sense of what is important and what is most useful to your visitors, you can’t go wrong with a sidebar on your website! QUESTION: What do you think is the most important element of a sidebar on an author’s website?